There have been fresh protests in the Chinese province of Xinjiang, where almost 200 people were killed in ethnic violence in July. 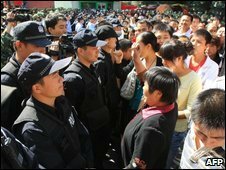 A witness told the BBC that as many as 2,000 ethnic Han Chinese had been demonstrating in the capital Urumqi. A trigger for the protests appears to have been a spate of unexplained stabbings using hypodermic syringes. Local media said nearly 500 people, almost all Han, had sought treatment for stabbing in the past few weeks. State-run news agency Xinhua said that 15 people had been arrested over the stabbings, and that four of them had already been prosecuted. A businessman in Urumqi told the BBC that members of the Han community had been demonstrating since Wednesday. "Nearly everyone in Urumqi is on strike or protesting. Right now in front of me there are at least 2,000 people," he said from the centre of Urumqi. Local state media said the protest was over a recent spate of stabbings by people armed with hypodermic syringes. A public service announcement on local Xinjiang TV said that 476 people had sought treatment for stabbing - 433 of whom were Han Chinese, suggesting the attacks were ethnically motivated. One Han resident told the BBC was concerned for his safety. "The local government is not doing enough to protect Han people there... I am really [worried about] my family and relatives there. I urge [the] Chinese government should do more to prevent this," he told the BBC. Protesters have accused the provincial government of being "useless", and some even asked for the dismissal of regional Communist Party boss Wang Lequan, who is thought to be an ally of President Hu Jintao. Large numbers of police blocked the protesters from reaching People's Square in the city centre. Thursday's demonstration underscores the lingering tensions that still remain in Urumqi after the July violence, despite the large police presence that remains in the city. The protests also come at a bad time for the central government in Beijing, as it prepares to celebrate the 60th anniversary of Communist rule on 1 October. The violence began when an initially peaceful protest by Uighur youths, apparently prompted by an earlier riot in a factory in southern China, spiralled out of control - with shops and vehicles burned and passers-by attacked. 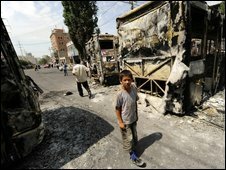 At least 197 people died and about 1,600 were injured, according to official figures. The government says most of the dead were Han, but the exile activist group the World Uighur Congress claims many Uighurs were also killed. Members of the city's Han community last held mass protests shortly after July's violence. Some Uighurs complain that Han migration into the province has diluted their culture and marginalised them economically. Han currently account for roughly 40% of Xinjiang's population, while about 45% are Uighurs. President Hu Jintao visited the region in late August and called for ethnic unity to be strengthened.